"The Ultimate ELVIS IN MUNICH Book"
In Germany another book was published, and while it may not be as well known as the foregoing mainstream releases it is every bit their equal. "The Ultimate ELVIS IN MUNICH Book" is a fascinating narrative and visual exploration of the time Elvis spent in the German city. 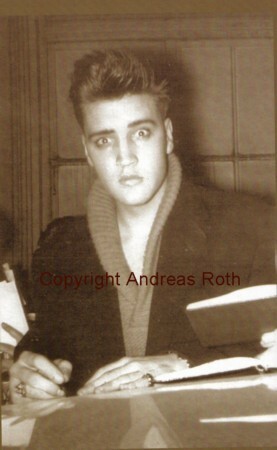 Andreas Roth has done a superb job in his research for "The Ultimate ELVIS IN MUNICH Book". Following up on many leads, Andreas has uncovered numerous little known aspects of Elvis' visit to the German city. While most fans will be familiar with Elvis' well chronicled visits to the Moulin Rouge, how many of us were aware of his visit to the Eve Bar on Karolinenplatz, just a few steps away from the "Amerika-Haus"? Not only does Andreas Roth give us illuminating text on this visit but he has sourced a sublime collection of photos from the evening. Undoubtedly the rare visuals in "The Ultimate ELVIS IN MUNICH Book" are what initially capture your attention. The many quality black & white candids show a relaxed Elvis obviously enjoying his time in Germany, while a number of glorious color visuals resonate in your mind long after their viewing. There many great photos inside "ELVIS IN MUNICH" including a "hidden" photo suggesting Elvis was definitely smitten with Angelika Zehetbauer, a dancer at the Moulin Rouge. One can only imagine what Elvis was thinking at the time! Another fascinating full-page photo shows Elvis arm-wrestling with Irene Mann. There is also a touching visual of Elvis tossing a basketball to young Robert Marquette, who was paralysed and confined to a wheelchair. As Andreas Roth tells us, Elvis visited the Marquette family on several occasions and became a good friend to the young boy. The full set of visuals showing Elvis with Robert symbolically parallels the story told in Lena Canada's book, "To Elvis With Love", about Elvis' pen-pal relationship with Karen, a young girl afflicted with cerebral palsy. Andreas Roth's lucid narrative based on his meticulous research offers great insight to Elvis' times in Munich. His vivid descriptions of Elvis' time in Munich, be it at the movies, out boating, visiting the set of "The Vikings" or The King's various nocturnal visits, offer an illuminating insight to what was Elvis' world for a short, but important time, in his life. There are also important recollections by Elvis' two Memphis Mafia companions while in Munich, Red West and Lamar Fike. These shed light on a number of issues, including whether there was a romance between Elvis and the very attractive movie starlet, Vera Tschechowa, and media speculation they had secretly got engaged and married. The author insightfully observes how the "photo love story" between Elvis and Vera served as the visual text which drove the evolution of their story in the German media. Showing what good investigative research can achieve, the author also reveals important information about the Rudolph Paulini photo session and the fact that there were at least two other photo sessions involving Elvis, but they were not in Munich! Another coup for Andreas Roth is presenting the reader with the transcript of an interview done between Elvis and Hannelmore Krab over a drink in the Hotel Bayerischer Hof. Great stuff!! The author also provides interviews with various other people who either interviewed Elvis or met him during his Munich visits. In a move sure to please many fans, Andreas Roth uses a two column design for the narrative, providing his text in both German and English. "The Ultimate ELVIS IN MUNICH Book" is printed on high quality gloss paper stock with sewn in binding for extra durability. Verdict: Andreas Roth's "The Ultimate ELVIS IN MUNICH Book" is an outstanding release providing an historic record of an important part of Elvis history. Not only is it one of the top five Elvis book releases of 2004, but with its strong research and many rare, stunning visuals, it ranks as one of the best ever Elvis publications. 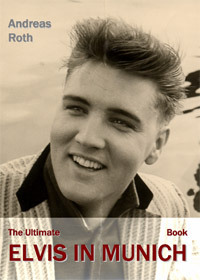 It is one of only a few Elvis books which will stand the test of time and take pride of place in any fan's Elvis library. Contact Andreas Roth & buy "The Ultimate ELVIS IN MUNICH Book"
What others have said about "The Ultimate ELVIS IN MUNICH Book"
”This will be kept along with the best Elvis photo books I have. “My compliments for the nice job you did. “You have every right to be proud of your book. Very good work, indeed.